The Chicago Cubs. The two cards below are from the recently released Topps Heritage High Numbers set. 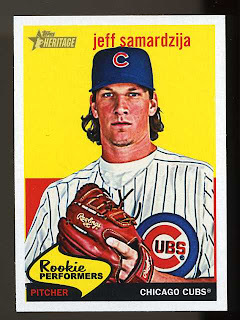 The first is RP7 Rookie Performers Jeff Samardzija and the second is FB5 Flashbacks Kosuke Fukudome. 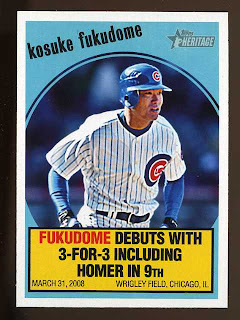 OK, so Fukudome is not a real rookie since he played for nine professional seasons in Japan, but since he is a rookie according to MLB, I'll include him as well. The PA announcer probably had to put in some extra work in the offseason!